Victoria Butterfly Gardens in Victoria, Canada is the ideal place for tourists to get a close look at a Giant Owl Butterfly. The Giant Owl Butterfly resides at the Victoria Butterfly Gardens in Canada along with many other species of butterflies but in the wild they are found from Mexico through to South America. This large butterfly is mainly brown in color with tan colored tips on their wings. The big spot on the wing of the Giant Owl Butterfly is used for defense and when they spread their wings the two eyes resemble an owl's face. Little birds that feed on butterflies in turn will get eaten by owls so they do not attempt to go after the Giant Owl Butterfly as it scares them. When the Giant Owl Butterfly is a caterpillar it is one of the ugliest caterpillars around but as you can see it evolves into a stunning looking butterfly. A young Giant Owl Butterfly feeds on banana leaves which carries many important nutrients needed for the butterfly to grow. 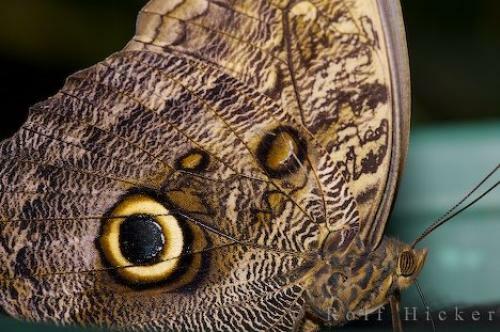 Photo of a Giant Owl Butterfly at the Victoria Butterfly Gardens in Victoria, Canada. Pictures from photo gallery "Butterfly Pictures"
This picture is part of the photo album "Butterfly Pictures" - there are more beautiful images waiting for you. Giant Owl Butterfly, Caligo eurilochus, at the Victoria Butterfly Gardens, Victoria, Vancouver Island, British Columbia, Canada. I photographed this photo with the digital SLR camera model Canon EOS-1Ds Mark II, aperture of f/13.0, exposure time of 1/250 sec. on ISO 200, as always I used a original Canon Lens, the focus lenght for this picture was 180mm.